Kurion's water treatment system underperformed by a vast margin, T-Hawk crashed on the roof of the Reactor 2 building, and now the Japanese robot "Quince" got caught in a bad juju at Fukushima I Nuclear Power Plant. "Quince" was designed and developed by Chiba Institute of Technology, and was going to install the water gauge for the highly contaminated water (radiation near the surface of water was 430 millisieverts/hour the other day) in the basement of the Reactor 2's reactor building. Quince tried to go there in the morning of June 24, but it got stuck in the stairway leading to the basement, and had to be retrieved by the carbon-based workers. 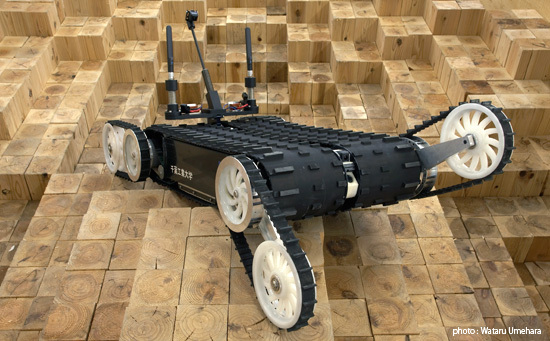 The Quince robot, developed by Chiba Institute of Technology for nuclear and biological disaster relief activity, had ventured out into the Unit 2 reactor building to set up a gauge to measure the contaminated water pooling in the basement. Radioactivity inside the reactor buildings is too high for workers to take measurements there. The machine got stuck at a staircase landing and failed to go downstairs, TEPCO spokesman Junichi Matsumoto said. A cable that was supposed to drop a gauge into the basement also malfunctioned. The workers retrieved the robot and were going to make adjustments before sending it back in for another try, Matsumoto said. He did not elaborate. TEPCO's handout for the press doesn't make any mention of it, although it does mention the crashed T-Hawk. A "cold shutdown" cannot even be defined for a broken reactor where the fuel core had melted away along with control rods and other in-vessel equipment and got out of the Reactor Pressure Vessel and probably out of the Containment Vessel. The RPV is broken, and so is the Containment Vessel. Sure, TEPCO measures temperature of the RPVs, but what does that mean, when the corium is already out of the RPVs? How could a temperature of a broken RPV be an indication for a "cold shutdown"? Do they know how hot the escaped corium is, or where exactly the corium is right now? Do reporters ask such questions? Goes to demonstrate what mainstream media does best: redact and reprint press releases. NewsBot's not very big, but any whiff of such mealymouthed propaganda and I can the story, or at least qualify it. Thanks very much for your work. We are many to follow you from France and I like presentation of facts and also your own comments on them. What do you think about the trend of Fukushima Trench Pit Water Watch you show on your pages ? What can explain the water level does evolve quite quickly down by now ? Classic case of "Robo nogo" maybe they needed some M.C.Escher stairs like the Q-bot is climbing in the picture. If this thing can't reliably go down stairs then what is the chance it could get back up them without aid? I guess the "lesson learned" is all nuclear power plants need to be retrofitted with handicapped access ramps for their gallant rescue Robos. The "Spirit" Mars rover managed to roam a hostile distant planet for years and covered 4.8 miles before it got stuck. With that in mind I wonder why the "retrieval unit" didn't just give Q-bot a helpful kick down the stairs? Isaac Asimov said that in the future robots would have human assistants and he was right.